Starting with small beginnings in 1960, we have made over 35,000 buckets and attachments. Northland Steel Products is a family owned and operated business based in the village of Waipu on Northland’s east coast. We have the latest state of the art equipment and technology, and our aim is Complete Customer Satisfaction. 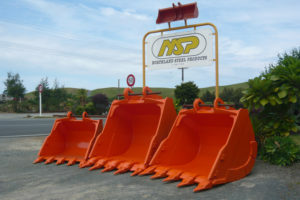 With our full range of equipment and specialist staff, we offer quality attachments at reasonable prices. We are proudly 100% New Zealand owned and operated and NSP is active in the Waipu Community as sponsors of local sports clubs and other local causes.